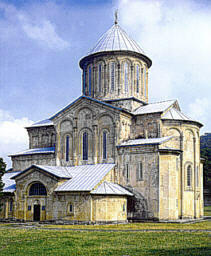 The construction of Bagrati Cathedral, named after Bagrat III, the first king of united Georgia, started at the end of the 10th century and was completed in the early years of the 11th century. Although partly destroyed by the Turks in 1691, its ruins still lie in the centre of Kutaisi. The cathedral represents the flowering of medieval architecture in Georgia.